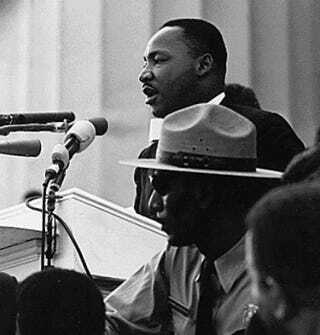 Martin Luther King Jr. giving his “I Have a Dream” speech during the March on Washington Aug. 28, 1963, in Washington, D.C. Most history students never learn that even Martin Luther King Jr.—arguably history’s greatest spokesperson on behalf of nonviolence—had armed guards stationed outside of his home and a pistol tucked in his sofa in 1955 when he emerged as the leader of the bus boycott in Montgomery, Ala.
As time went on, he came to trust in the philosophy of nonviolence in his personal life as much as he believed in its power politically, and eventually got rid of both the guards and guns. At some point, though, we glossed over this complexity and began to think of nonviolence as preordained and as a natural outgrowth of the movement. We don’t teach our children about the training civil rights activists had to endure in order to prepare their minds and bodies for nonviolent protests. And we don’t often think about how the movement functioned in rural places, far from the glare of the spotlights of network news cameras. Outside of the national gaze, what might check the violence of white segregationists who resisted every attempt by black citizens to assert their right to vote and to organize politically? How did the movement work in the face of the violence in rural Union County, N.C.; Lowndes County, Ala.; or Sunflower County, Miss.? That’s the story masterfully told by Student Nonviolent Coordinating Committee field secretary and now journalist Charles Cobb in his challenging and important new narrative, This Nonviolent Stuff’ll Get You Killed: How Guns Made the Civil Rights Movement Possible, which adds to a growing list of important histories that expand what we know about the way organizing had to work in rural communities. Historically, black citizens had to arm themselves; they hunted and, more important, they maintained their homes and the safety of their families against anyone who might challenge it. After all, black families who owned land, ran businesses or sought an education for their children did so in spite of Southern white supremacists who often employed violence to try to assert superiority over and displeasure with any sign of black achievement. It didn’t mean that most black Southerners were violent or did not believe in the tactical power of nonviolence grounded in Christian ethics. But Cobb’s narrative reminds us that many black Southerners believed in both nonviolence and self-defense, and they didn’t see them as ideas that had to be at odds with each other. When I think of how these two ideas dovetailed in the lives of black Southerners, I think about my great-uncle Obie Duncan. Uncle Obie could best be described as a rough-and-tumble man. He and my grandfather grew up in rural Georgia, the sons of a sharecropping father who was forced to sneak away with his family at night from a landowner who planned to keep the family in continuous debt by cheating them out of their share of the crops year after year. Uncle Obie and my grandfather hoboed on trains as teenagers looking for work. They were self-taught carpenters who built their own homes from the ground up. Uncle Obie was also a veteran of World War II and generally didn’t have a lot of patience for the racism of the South after he returned from the war. Healthy until the day he died, he was in his 90s when his heart simply gave out one day. At his funeral, his pastor lauded the Christianity and charity of Uncle Obie. He talked about the way he shared the food he raised in his fields with his neighbors—of all races—the ways he helped those who were sick and shut-in and his devotion to his church and family. At the end of the service, I was left thinking that the pastor had failed to capture Uncle Obie’s hard and resilient side. But when we returned to his home after the funeral and went to the bedroom to change clothes, we found a loaded shotgun behind the door. My mother and I both smiled and laughed—that was Uncle Obie. Like many black Southerners of this generation who kept the shotgun behind the door, my uncle had Christian faith and a faith in self-defense. It’s that ethos that Cobb recaptures with stories of black Southerners who worked behind the scenes to protect civil rights activists who engaged in nonviolent protest, the conversations that student organizers had with local black Southerners about the dilemma of whether or not to “bring their pistol” when they went to try to register to vote, and grassroots cooperation between both sides that quietly undergirded the movement in the rural South. Cobb invokes the language of “stand your ground” here in an instructive and provocative way, forcing us to learn that along with pushing for constitutional rights promised in the 14th and 15th amendments, black Southerners, quietly, were often also fighting for their Second Amendment rights, too. Blair L.M. Kelley is an associate professor of history at North Carolina State University and the author of the award-winning book Right to Ride: Streetcar Boycotts and African American Citizenship in the Era of Plessy v. Ferguson. Follow her on Twitter.